Great News from Bear's Den. 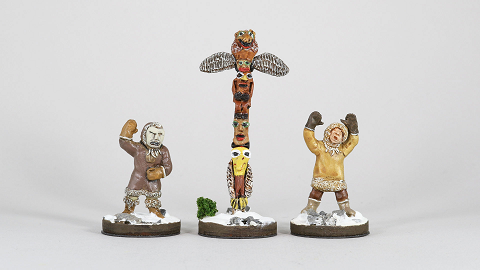 They have re-released the Inuit dog sleds and dancers and totem. These have been completely remastered and remolded for crisp, clean new castings. Additionally, Bear's Den has released brand new packs of civilians (4 new figures) and casualties. This tremendous range provides fantastic figures for a host of different game genres (Inter-Inuit warfare, American/Russian/Canadian colonial campaigns, Victorian Pulp and even Fantasy to name a few. And, Bear's Den is not done there. Later in 2018, they will be releasing more Inuit, different loads for the sleds (dead seal, different packages, etc.) and a range of monsters from Inuit lore. 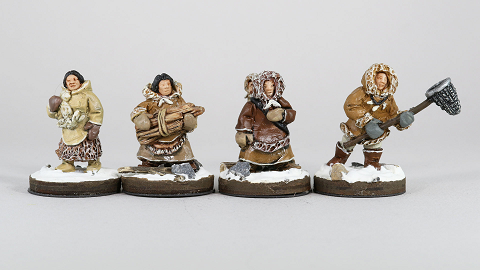 Bear's Den Inuit are available exclusively from Badger Games! This entry was posted on Wednesday, April 18th, 2018 at 18:23 and is filed under News. You can follow any responses to this entry through the RSS 2.0 feed. You can skip to the end and leave a response. Pinging is currently not allowed.